You’ll know you’re a minimalist if you favour straight lines, clutter-free spaces, functional layouts and simple yet elegant aesthetics. Does this sound like you? If it does, then you’re going to love the cooking spaces we’ve gathered below. Minimalism is all about paring back your ornamentation, flourishes and adornment. These are often added to decorative interiors to provide comfort, warmth and personality, but are in no way essential. We’re looking at 8 different kitchens, which each contain a unique edge and individuality, as well as practical arrangements and a pared-back atmosphere. 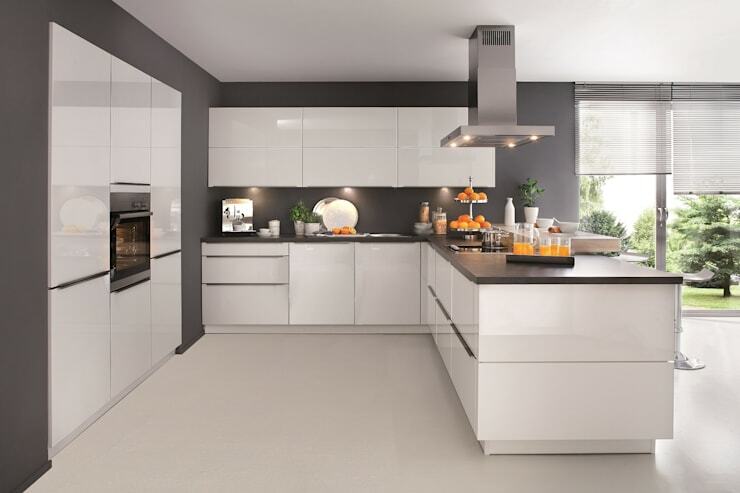 Simple and achievable, we’re sure there is something to suit everyone, along with providing inspiration to those undertaking their own kitchen renovation or refurbishment. 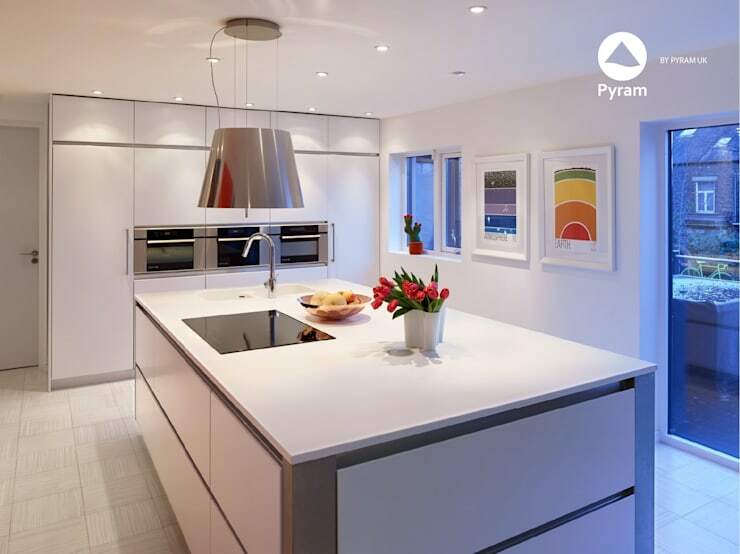 Choosing the right colour is crucial to the success of your minimalist kitchen. 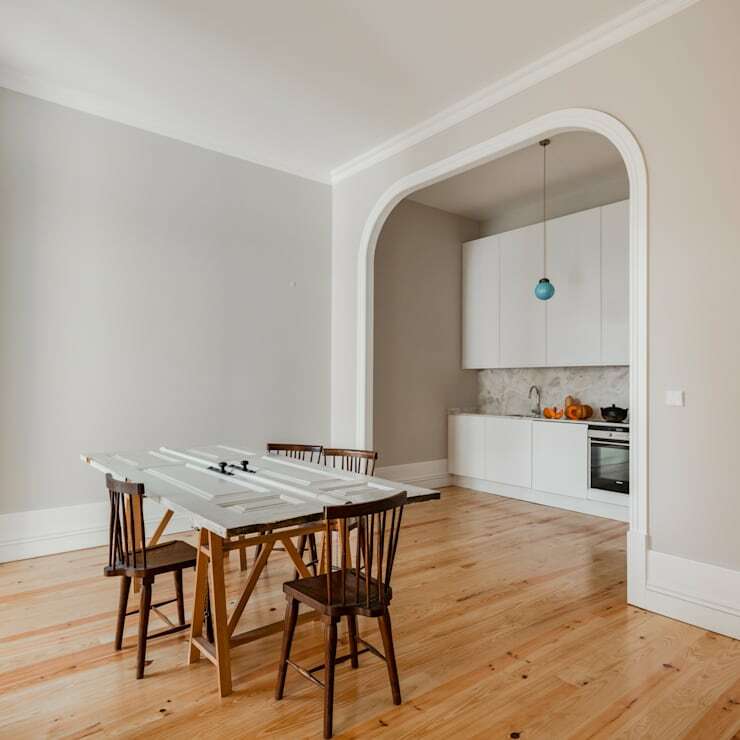 However, you needn’t feel afraid of adding colour, as not all minimal spaces should be simply white. Add interesting lines, bright hues and combine with an overarching sense of clutter free aesthetics. So you want to add a little personal touch to your kitchen, but are unsure where to start. Look to your walls as a way to add individual elements, while keeping your joinery simple and functional. 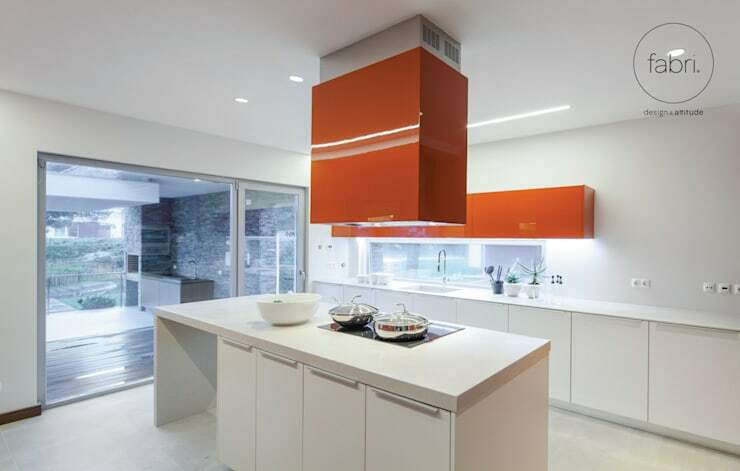 This fabulous kitchen embraces a bright orange hue for the overhead cupboards and extractor fan. Here the shelving is fitting free, offering a minimalist look with a joyful and personal touch. 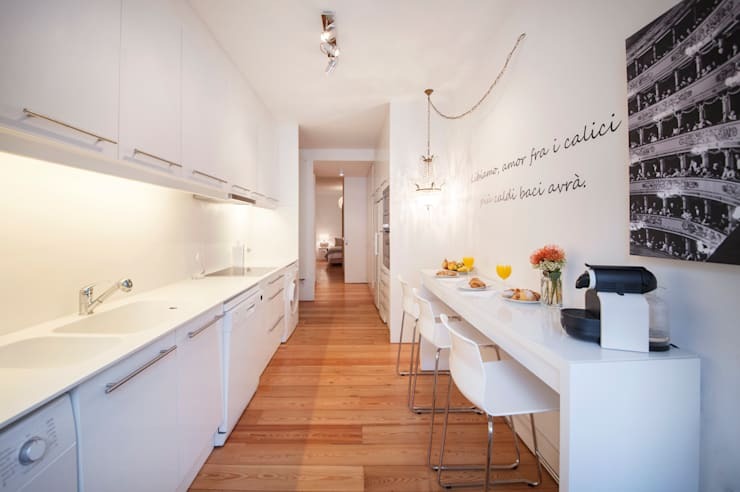 The designers of this kitchen have kept things simple with monochromatic hues including grey and white. This adds contrast, yet keeps the overall ambience clean and uncomplicated. 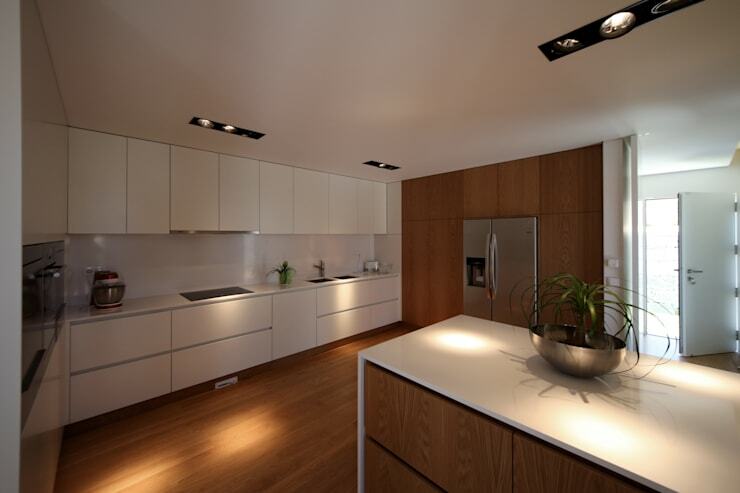 This wonderfully minimalist kitchen is hidden in an alcove, contributing a sense of practicality and cleanliness. The über-modern cooking space contrasts the heritage architecture well and is a goof example of how this combination of styles can work in your favour. Long galley kitchens work especially well when they are kept clean and simple. A far cry from their maritime counterparts, these domestic kitchen designs are effortlessly stylish and sure to work well in a compact or space-poor home. Don’t forget timber! 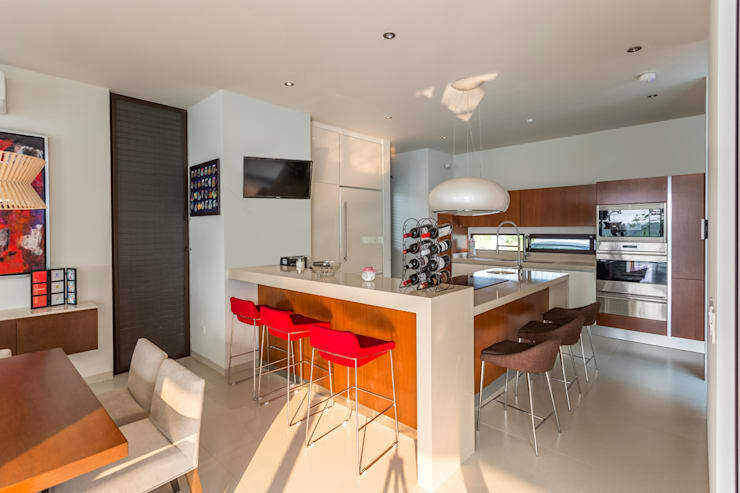 Wood works brilliantly in minimal cooking areas, adding warmth to especially clean lines and strong architectural forms. Who says a minimal kitchen can’t boast some personalisation through decorations? The key is to keep it simple and add your ornaments slowly to avoid overcrowding the space. Floral blooms and wall hanging are a nice touch, while a well-placed fruit bowl doesn’t go astray wither. 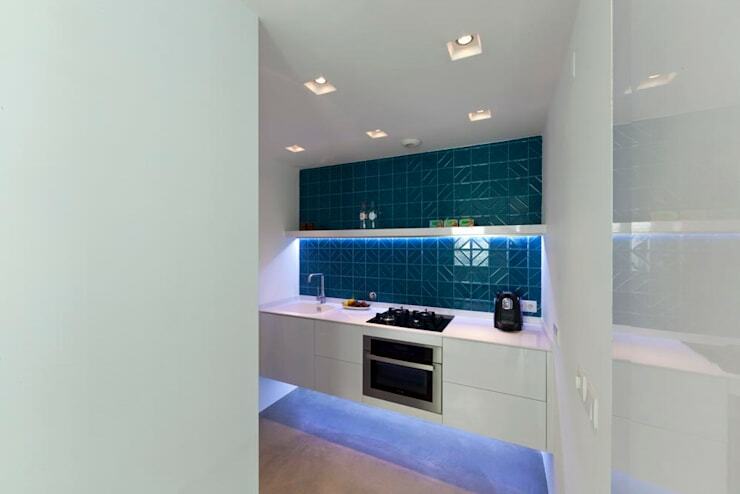 Which kitchen would best suit your home?